Broadside, 4 3/4 x 6 1/2 in. Ferguson 888b. Copies: Ferguson addenda volume gives ANL, but item is not in online catalogue and unable to locate. 1 folded leaf ; 15.5 x 20 cm folded to 15.5 x 10 cm. 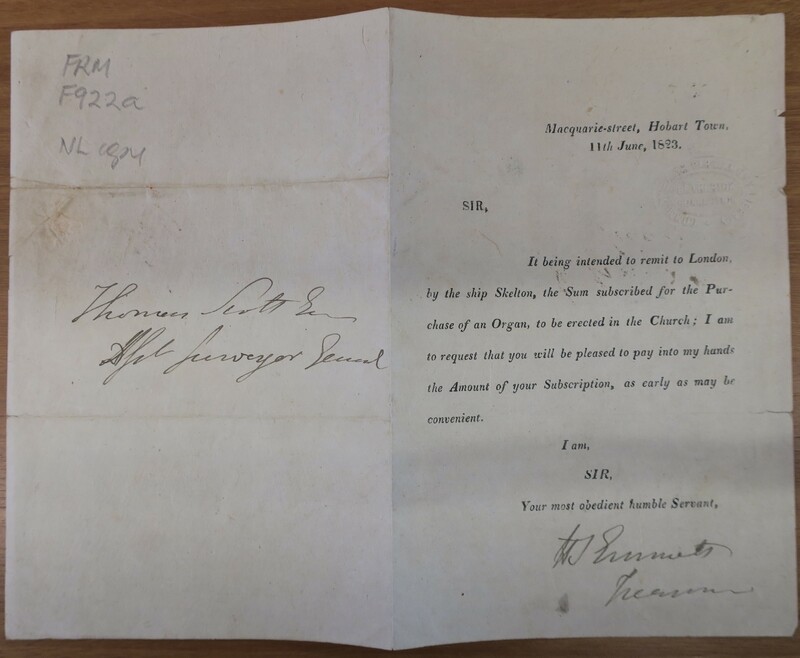 Signed by H. J. Emmett Treasurer; addressed to Thomas Scott Esq Asst Surveyor General. Crease lines where folded circular has been twice folded again to form a letter. Blind stamp of Commonwealth Parliamentary Library. Petherick Collection. Not in Ferguson. Copies: Wilson Collection. Broadside. 23 × 18.7 cm., printed on two sheets joined together and laid down on a backing sheet. Additional contemporary manuscript regarding fees. Hannah Maria Davice and Elinor Binfield arrived in Hobart Town on the Berwick on 21 June 1823. On 19 July they advertised in the HTG their intention of opening a school at Buckinghamshire House, on the corner of Macquarie and Harrington Streets, to commence on 28 July. Bent had received by the Berwick a much needed ‘entire New Font of Type, from the Letter-foundry of Messrs. Caslon & Livermore, of London’ and he put it to use immediately in the Gazette of 5 July. This prospectus, which uses a variety of fonts, was probably one of the first items he printed using his new type. HTG 26 July 1823 noted it as recently published. Not in Ferguson. No known copies. Bromley, Edward Foord. 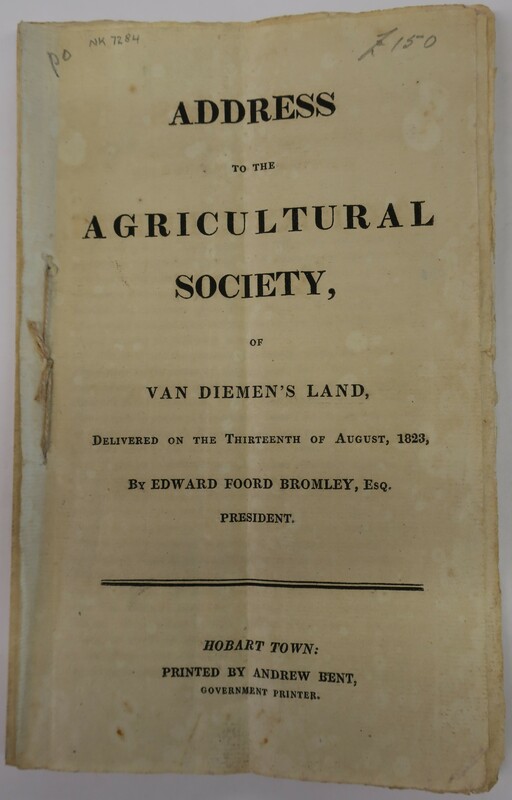 Address to the Agricultural Society, of Van Diemen’s Land, delivered on the thirteenth of August, 1823, by Edward Foord Bromley, Esq. President. Hobart Town: Printed by Andrew Bent. Government Printer. In 1820 VDL received favourable publicity in Britain in a review of Michael Howe (Quarterly Review May 1820) and in a book published by Charles Jeffreys. As a consequence emigration was flowing strongly towards the southern colony at the expense of NSW. In July 1823 Justice Barron Field, president of the Agricultural Society of NSW, gave a speech in which he compared the two colonies, much to the disadvantage VDL. Printed copies were sent to England, and extracts were made in the Sydney Gazette. Bromley’s speech to the Agricultural Society in Hobart, said to have been from the pen of Governor Sorell himself, was a spirited rebuttal to Field’s remarks. Bent later described how several thousand copies of it were struck off and immediately sent to England (CT 10 Nov. 1826). Bromley’s speech and the remarks which provoked it were printed in the HTG on 16 Aug. 1823, and reprinted in England in the Farmers’ Magazine 9 Aug. 1824. A Public Meeting will be held in the Argyle-street Chapel … [circular for a meeting on 17 Nov. 1823 to form a Wesleyan Branch Missionary Society] Hobart Town, Nov. 11, 1823. Ferguson 927a. Copies: Ferguson addenda volume gives ANL, but item is not in online catalogue and unable to locate. 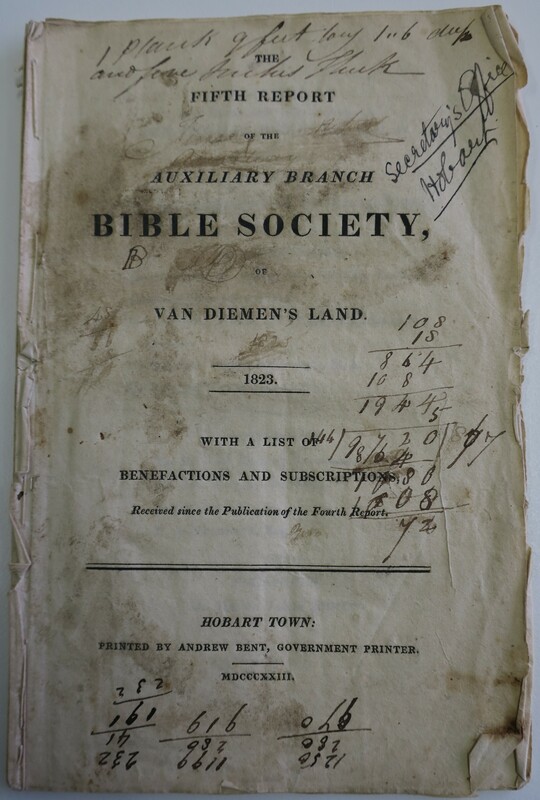 The fifth Report of the Auxiliary Branch Bible Society of Van Diemen’s Land. 1823. With a list of Benefactions and Subscriptions, received since the Publication of the fourth Report. Hobart Town: Printed by Andrew Bent, Government Printer. MDCCCXXIII. 24 p., 21 x 13.5 cm. TU copy printed on a “rustic” paper watermarked B over 1821 over 3 possibly made in Sydney. Publication announced in HTG 13 Dec 1823. Accounts for June 1822-July 1823 include a printers bill for annual report &c. for £8.12.6 (p. 18) also a 2 year subscription paid by A. Bent (p. 14). Broadside, 43 x 28 cm. Ferguson suggests publication date of 1822 but this list includes the names of seven districts in the County of Cornwall which were not promulgated until 19 Dec. 1823 and were published in HTG 20 Dec. No long S. Not certain if printed in VDL, but if so would be by Bent. Signed by Deputy Judge Advocate Edward Abbott, 1 Jan. 1824. 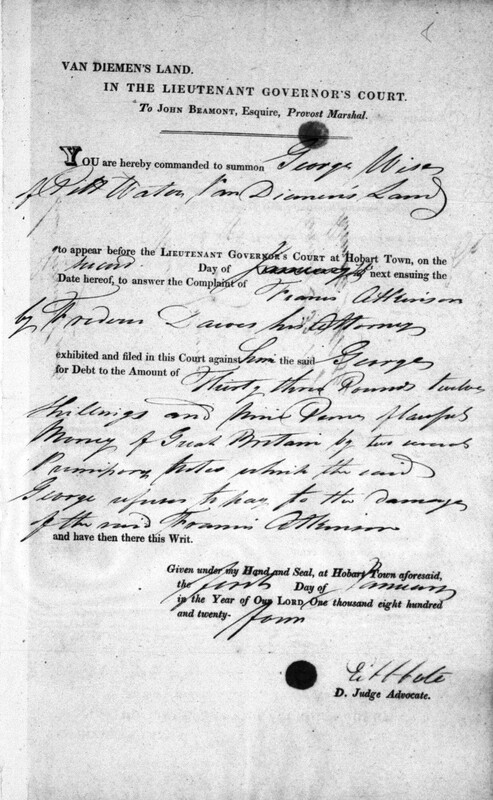 George Wise is summoned on the complaint of Francis Atkinson. 76 X 122 mm. The first bank in VDL was established following a meeting on 11 Aug. 1823. 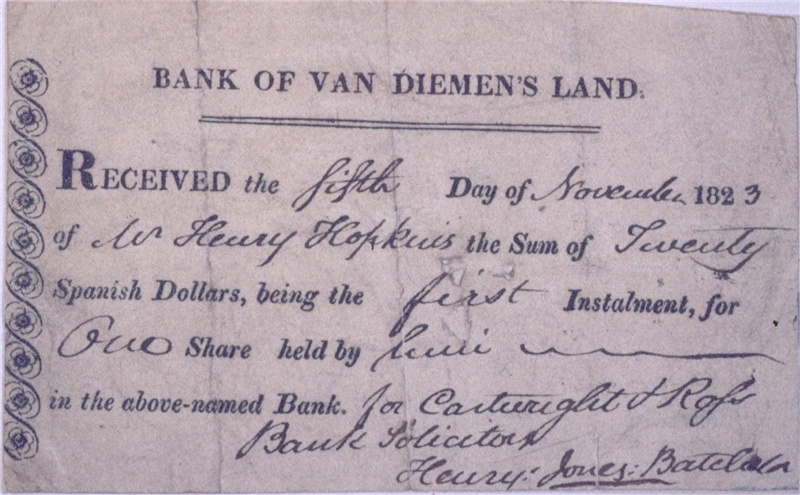 Henry Hopkins was not among the original shareholders listed in the Bank’s charter, but there were still a few shares available in October. One share was two hundred dollars, payable in instalments. In the 1825 Tasmanian Almanack Bent was listed as the letter press printer for the bank, but the notes were engraved by Thomas Bock and printed by William King. A number of promissory notes printed by Bent in or around 1823 are included in the W. L. Crowther Library in: Tasmanian paper currency [album] / collected by Dr. William Edward Crowther. TAHO CRO.STORE 737.42 CRO. Some have been digitised on Libraries Tasmania website. They vary slightly in size but are generally around 6 to 7 cm. x 12 cm. Some were obviously printed before Bent received his new type in July 1823, and are generally similar in style. All these use a line of dots to mark off the left hand edge where the issuer’s name is printed. The last two examples were printed using the new type and have more decorative features. M. Lord. One Spanish dollar. Printed 182? Signed by Maria Lord 1 Mar. 1823? The name M. Lord along left side in Old English possibly added by hand. James Hume, Elizabeth Street. One shilling. Printed 182- (but must be 1823 as James Hume arrived in Hobart in Jan. 1823). Written 1 Sep. 1823. Lempriere, Weavell & Co., Elizabeth Street. [Weavell has been crossed out]. Spanish dollars. Printed 182-. Written for 8 dollars 7 May 1823. Simon Lake & Geo. Aylwin, Smiths & Tallow Chandlers, Elizabeth-street. One shilling. Printed 1823. Handwritten date illegible. John Lepine, Cabinet Maker, Upholster &c. Humphrey-street. Ten shillings. Printed 1823. Written Aug. 1 1823. James Parker, Grove Inn, New Norfolk. Two Spanish dollars. Printed 1823. Written 26 July 1823. Young & Dillon, wholesale wine & spirit merchants, Argyle-street, One shilling. Printed 1823. Written 7 Sep. 1823. 68 X 118 mm. Edward Walker, Bread & Biscuit Baker, Elizabeth Street, Half a dollar. Printed 1823. Written 30 Aug. 1823. 58 X 122 mm.